Theory of Mind describes the ability to put oneself in another person’s position and make assumptions about that person’s feelings, thoughts, intentions, wishes or motives. Theory of Mind is a key facet of social cognition and one that is important for complex communication. It may be impaired in mental disorders or as a result of neurological disease. In consequence, the TOM is used in clinical neuropsychology. Four pictures that tell a story are presented in random order: the testee must arrange them to form a meaningful sequence. If the testee arranges the pictures incorrectly, this is indicated and the correct sequence is shown. Once the pictures are in the correct order, questions are asked about the likely intentions and thoughts of the people depicted. 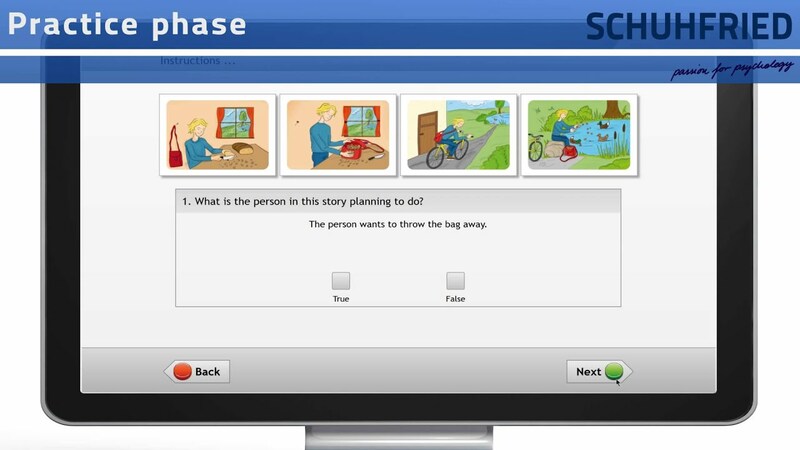 Both aspects of the Theory of Mind are therefore tested: arranging the pictures tests understanding of social interaction, while the questions test recognition of other people’s probable intentions and thoughts. Subsidiary variables provide more detailed information on strengths and weaknesses.